Enjoy 66' Big Rig sites, 30/50 amp-Wifi-Cable. On-site convenience store, nearby outlets & antiquing. Groups enjoy a fully-loaded recreation hall. Day trips to Mt St Helens & Mt Rainier. Nearby Restaurant, Sportsplex. This is an excellent place to take a break from I-5. Our pull-through site was well-maintained and level, and the restrooms were clean. The registration area and associated store were also attractive and in good condition. Great little park. Very big rig friendly with wide streets and easily accessible sites. Pull through with plenty of room for motorcoach and towed car. Very well-maintained and attractive. All hook-ups were good. Site nice and level. Excellent restaurant for breakfast and lunch on the property. Not too much else in the Centralia area except some outlet shops. Great place to stay while traveling the I-5. This is one of our favorite overnight places to stop. Always neat and clean, the sites are roomy and level. Management is tops. Arestaurant next to it is very handy and serves delicious food. We use this RV park every time we can. Did an overnight stopover. Pet area is grassed, outside of main park. Has pull thru sites. Sites are narrow though, not really conducive for awnings, enough room for slides though. Washrooms are coded entry, wifi is stable. Good place for an overnighter, but any length of stay would be boring. 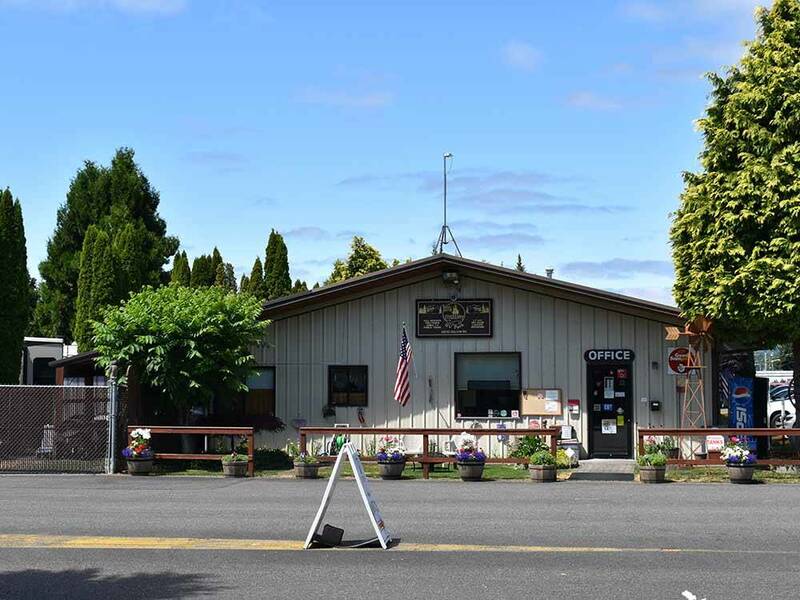 Nice RV park, clean grounds and near level pads. Hook ups easy to access and little store has lots of little needed things. Other than that, there is really nothing here. Lots of full timers, clean bathrooms and WiFi. Nothing really within walking distance, no fire pits or activities that we could find. Thought the price was rather steep for what you really got, nice stop over spot if you want to spend $45 plus tax. Mine is an older RV, well used but it works and serves my family well. I arrived late in the evening after driving all day. Early the next day I had a knock on the door and was informed that if we were to stay we needed to wash the RV but we couldn't do it on site, the owner is very picky about how it looks (which is a bit ironic when my husband found a homeless man showering in the bathroom and filling water bottles). Not an experience that made me feel welcome. Also, not family friendly. There are NO activities for children available. This was the cleanest and nicest park I have stayed at but if you don't fit their image of who they want there the reception may be less than expected. We just started fulltiming in our new coach but we're going to be tethered to the Olympia area for another 20 months before becoming nomads. We wanted a place that accepts monthly guests and is safe, offers 50 amp service, clean and provides nice separation between RVs. 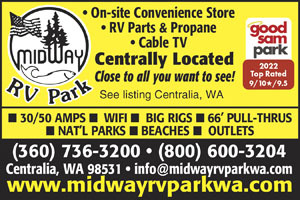 Midway RV was our first choice in the area and we were lucky enough to get into a monthly pull through. We've been here for a about a month now and I'm happy to report that everything we wanted is here. The helpful staff keep the part clean, it's safe and the trees, lawn and landscaping provide a nice appearance. The owner is here several days out of the week and has made good infrastructure investments into power, sewer, water, WiFi and cable TV. Lovely Park over all. However site #33 is unsightly and downgrades this park from a 5 to a 3 star park. Being aware that extended stay guests help keep some parks afloat there are always some residents that take advantage and spoil it for others. The onsite restaurant has excellent food, and outstanding service. We enjoyed the spacious lots and quiet location. The grounds were very well maintained as you always saw someone maintaining the empty lots. The laundry room was clean and monitored and the office personnel were very helpful and cordial. We stayed here only one night. I was struck by how clean everything was. Very nice!